Activity continues at Arianespace for the next flight, a dual payload mission with the Ariane 5 set for March 21—two satellites will be aboard, the SGDC and KORESAT-7, and the liftoff will occur at the Spaceport in French Guiana. The heavy-lift vehicle was delivered to Arianespace earlier this month by the production prime contractor, Airbus Safran Launchers, with the Ariane 5’s transfer from the Spaceport’s Launcher Integration Building – where it underwent the basic buildup – to the Final Assembly Building for integration of its two payloads. The Ariane 5 for Flight VA236 is transferred to the Spaceport’s Final Integration Building, where it is being fitted with the SGDC and KOREASAT-7 satellite payloads. In parallel, the two satellites have been progressing through their own pre-flight preparations, with both now in the Final Assembly Building. As the mission’s upper payload, SGDC was installed on Ariane 5’s SYLDA dispenser system, and then encapsulated in a long version of the launcher’s ogive-shaped payload fairing. Separately, KOREASAT-7 was integrated atop Ariane 5, to be followed by positioning of the SGDC/SYLDA/payload fairing combination atop it. The Ariane 5 mission with SGDC and KOREASAT-7 will be Arianespace’s second flight during the month of March, and its fourth so far in 2017. Designated Flight VA236, it follows the year-opening launches of a lightweight Vega on March 6 with the Sentinel-2B Earth observation spacecraft, the February 14 mission using an Ariane 5 to orbit the SKY Brasil-1 and Telkom 3S relay satellites, and January 27’s launch of a medium-lift Soyuz to orbit the Hispasat 36W-1 telecommunications platform. Both satellites for Flight VA236 were built by Thales Alenia Space, with the mission’s total payload lift performance set at 10,289 kg. to geostationary transfer orbit. During integration activity in the Spaceport’s Final Assembly Building, Ariane 5’s payload fairing is lowered into position over the SGDC satellite, which is installed on the SYLDA dispenser (photo at left). 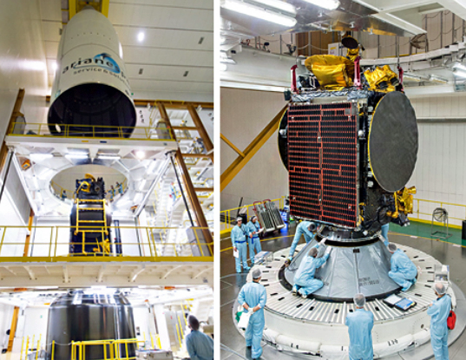 In the photo at right, KOREASAT-7 is secured atop Ariane 5’s core section. 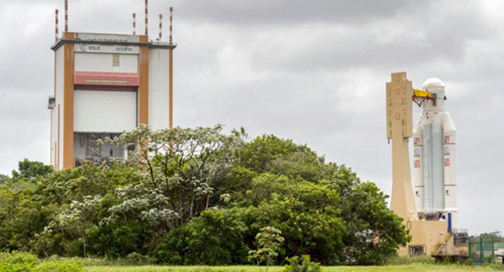 SGDC is the first Brazilian government satellite, as well as the initial spacecraft to be launched by Arianespace for Visiona Tecnologia Espacial S.A. – the SGDC prime contractor, responsible for the program management, overall system integration and end-to-end communication. This dual-use (civil and military) relay platform will enable the implementation of a secure satellite communications system for the Brazilian government and armed forces, while also reducing the digital divide in Brazil. The SGDC spacecraft will be operated and controlled by Telebras, a Brazilian telecommunication company managed by the Ministry of Science, Technology, Innovation and Communication. Based on the Spacebus 4000C4 platform, the SGDC platform carries 57 transponders in Ka- and X-band. It will have a liftoff mass estimated at 5,735 kg., and is to be positioned at an orbital slot of 75 deg. West. The KOREASAT-7 passenger on Flight VA236 is designed to provide improved throughput and wider coverage over Korea, Philippines, Indochina, India, and Indonesia. Equipped with Ku-band and Ka-band transponders, it will have a liftoff mass of approximately 3,680 kg. and is built on an upgraded Spacebus 4000B2 platform. The satellite’s added steerable Ka-band capacity is designed to support further demand in relay services. Once in its orbital slot of 116 degrees East, KOREASAT-7 will be operated by KT SAT – a wholly-owned subsidiary of KT Corp., which is the largest telecom/media service provider in South Korea and the country’s sole satellite service provider.